Week one of the college football season is notorious for David and Goliath matchups between top-tier Division I universities and smaller schools unable to match status and talent. Usually, Goliath snaps David’s slingshot after the first quarter. 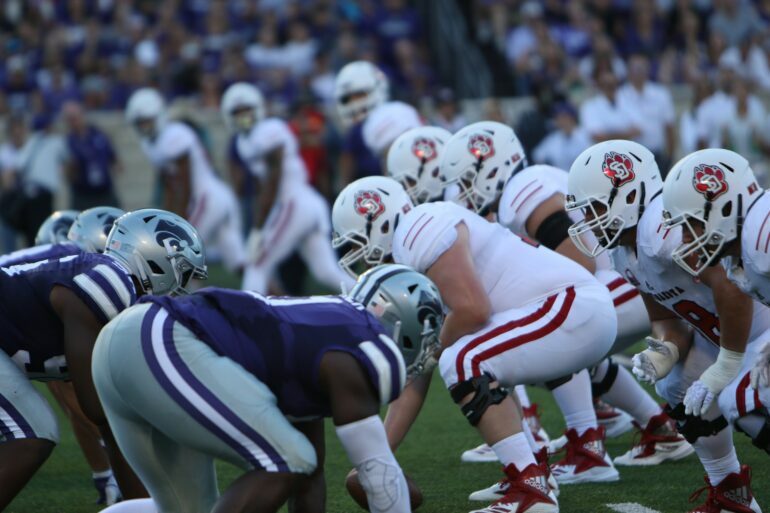 This was not the case during USD’s trip to Bill Snyder Family Stadium in Manhattan, KS, where the Coyotes hung with Kansas State until the final second of the game, losing 24-27 in promising display from head coach Bob Nielson and his team. A Coyote offense that ranked first in the MVFC for total yardage a year ago struck first just under seven minutes into the game as sophomore kicker Mason Lorber hit a 27-yard field goal to put the Coyotes up 3-0. Kansas State answered four minutes later with a 24-yard field goal from KSU sophomore kicker Blake Lynch. With two minutes remaining in the first quarter, junior quarterback Austin Simmons sprinted right from KSU’s two-yard line, sneaking inside the pile-on to cap off a 74-yard drive with USD’s first touchdown of the season and the first rushing touchdown of Simmons’ collegiate career. The Coyotes led the Wildcats 10-3 after one quarter. Throughout the second quarter, Kansas State chipped back with the leg of Blake Lynch as he hit field goals from 22, 38, and 44 yards in three of the Wildcats’ five second quarter drives, putting KSU up 12-10. Despite losing the lead, the Coyotes took advantage of the last two minutes of the half. With 1:29 left, Simmons threw a 7-yard strike to junior receiver Dakarai Allen in the endzone, set up by a 37-yard rush from sophomore running back Kai Henry two plays prior. Down 17-12 with 1:09, Kansas State junior quarterback Alex Delton, who replaced sophomore starter Skylar Thompson in the first quarter, threw a pass that USD senior linebacker Alex Gray snagged from the air on the first play of the drive. Gray returned the ball 25 yards to KSU’s endzone for a pick-six. A loud Coyote squad exited a quiet Bill Snyder Family Stadium at halftime with a 24-12 lead. Simmons ended the half with 131 passing yards and one touchdown on 12-17 passing, sophomore receiver Levi Falck accumulated 81 yards on six catches, and Henry ran for 46 yards on six attempts. Both defenses held sturdy in a scoreless third quarter. USD had a chance to put on three points with nine minutes left in the third, but Lorber came up inches short on a 51-yard field goal, the ball bouncing off the crossbar. The opening pass of the fourth quarter came from the hand of Delton and was intended for junior receiver Dalton Schoen, who bobbled the ball up to USD sophomore safety Phillip Powell. Powell hit the ground with control of the ball, securing USD’s second interception of the game. USD couldn’t transform the turnover into points and punted the ball to Kansas State junior receiver/returner Isaiah Zuber, who caught the ball at KSU’s 15-yard line and returned it 85 yards to USD’s endzone with 12:12 left on the clock. After the KSU defense stopped USD on the proceeding drive, Zuber found the endzone again on a 10-yard pass from Kansas State QB Skylar Thompson, who re-entered the game at halftime. KSU junior running back Alex Barnes then stretched into the endzone to complete a two-point conversion, giving Kansas State their first lead since the second quarter, 27-24 with 7:21 remaining in the game. Kansas State stopped another USD drive and ate the clock down with eight straight rushes. They entered victory formation with intent to run out the 70 remaining seconds, but caught a false start penalty, sending them back four yards to a 3rd & 5. Thompson completed a six-yard pass to Schoen the next play, setting up a 1st and 10 on USD’s 19-yard line. Instead of taking the knee, the Wildcats opted to give the ball to Barnes, who fumbled after a hit from Philip Powell. USD recovered the ball with 50 seconds remaining. In the next 49 seconds, Simmons found Dakari Allen and sophomore receiver Levi Falck three times each for a total of 55 yards. USD set up for a field goal on KSU’s 29-yard line with second remaining, but a false start penalty pushed them back to the 34-yard line. Mason Lorber’s last second field goal attempt fell short of the endzone and Kansas State took the win 27-24. Austin Simmons’ busy day entailed 257 yards on 24-56 passing, one rushing touchdown, one passing touchdown, and no interceptions. Falck tied USD’s single game reception record with 11 catches for 140 yards. Henry tallied 58 yards on ten attempts. Powell finished with six solo tackles, two forced fumbles, and one interception. Alex Gray tacked six tackles, one sack, one fumble recovery, and one interception. Kansas State running back Alex Barnes ran for 109 yards on 21 carries, and USD’s defense held both KSU quarterbacks to a combined 152 yards. Austin Simmons threw 56 passes in the match, almost four times the amount of rushes (15) from USD running backs. Nielson said this was accredited to Kansas State’s rushing defense, which ranked 8th in the NCAA in 2017 with 108.9 yards per game, according to TeamRankings. Nielson said Simmons showed promise in his first game as the Coyote’s lead quarterback. Simmons said taking the offense’s helm is a different experience than what he’s used to. On the other side of the ball, Alex Gray said the Coyote defense “came out hot”, holding KSU RB Alex Barnes to 24 rushing yards in the first half. Gray and Simmons said the atmosphere at Kansas State was exciting, but didn’t change anything. Regardless of the loss, Coach Nielson said there were two main points to take away from the game. “Number two, it reinforces the fact that we need to take advantage of every opportunity and every little thing makes a difference,” Nielson said. USD returns to Vermillion Sept. 8 to host Northern Colorado at 2 p.m. in the DakotaDome. “We’ll take this game for what it’s worth and bring it to a higher level next week,” Nielson said.